100% all natural trace-mineral rock mined in the Rocky Mountains. Contains more than 50 trace minerals including sodium, calcium and potassium that are beneficial to antler growth and overall herd health. Attracts elk, moose, bison, deer, antelope, sheep and more. 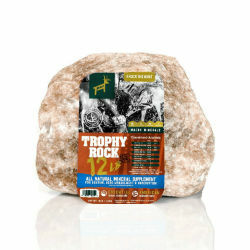 Trophy Rock contains over 60 beneficial trace minerals to improve antler development and overall herd health, and is safe for all wildlife year round. Stands up to the weather longer than conventional pressed blocks.